Dan Glenn coached beach volleyball Olympians Misty May-Treanor and April Ross when they went to Newport Harbor High School. So who does Glenn want to win the Showdown in the Sand? 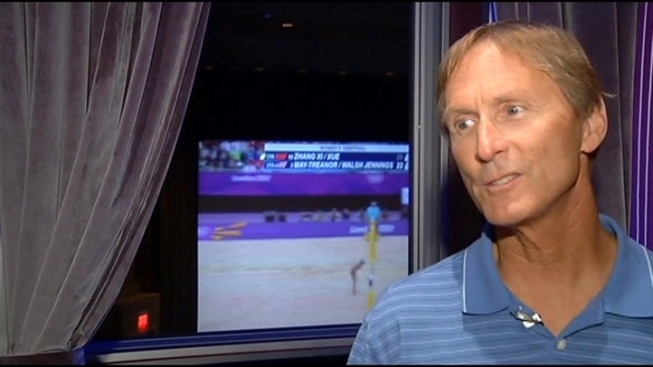 Olympians' High School Coach: "I'm Neutral"
When Volleyball coach Dan Glenn watches the women's beach volleyball gold medal match on Wednesday, he's going to have a tough time choosing a side. "I'm always joking, I'm going to be Switzerland -- I'm totally neutral on this," Glenn said. Glenn has been the volleyball coach at Newport Harbor High School in Newport Beach, Calif. for 26 years. During that time, he's coached both Misty May-Treanor and April Ross. On Wednesday, those two women will compete against each other for the gold -- May-Treanor with long-time beach volleyball teammate Kerri Walsh Jennings and Ross with teammate Jen Kessy. "Nothing these two have done has surprised me," said Glenn. "They've won, between them, I think five state championships when they were at Newport Harbor High School." Glenn will watch the gold medal match with his entire current team at the New Port Theatre, and he'll be watching with pride. "They're just fabulous role models, so that's the exciting thing," says Glenn. "It's really selling this sport, because everybody gets to watch now what I've seen for years and years with these guys playing." The two teams will play for gold at 1 p.m. PT Wednesday.